The Orangeville Junior A Northmen won their second game of the season on Friday (May 19) night when they hosted the St. Catharines Athletics at Tony Rose arena. After giving up the opening goal at 2:10 into the game the Northmen returned with a strong first period to score four in a row. Northmen goals came from Braydon Cresswell, Tyler Mackay, Scott DelZotto, and Dylan Watson. The Athletics managed to finish off the period with two late goals to make it a 4-3 O-ville game going into the second period. St. Catharines manage to take the lead in the second period scoring at 25 seconds into the frame to tie it up then going ahead on another goal a the midway mark. O-ville’s Jordan McKenna tied it up with 28 seconds left in the second period and Dylan Riley got one in just under the clock with a second to go before the buzzer sounded to get the go ahead goal. The game was again tied early in the third period when St. Catharines hit the back of the net. 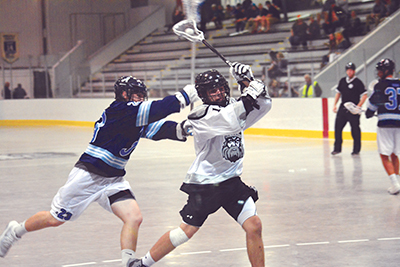 O-ville’s Justin Brack and Tyler Mackay scored just over a minute apart to put the Northmen back in the lead. St. Catharines fought back with a mid period goal but with a one goal lead the Northmen held on and capped the game with a final empty net goal from Kyle Stavely when the Athletics put and extra attacker on the floor. The Northmen left with a 9-7 victory for the night. The Orangeville team started off the season with a loss to the Whitby Warriors but returned to the floor with a win in game two of the season when they went up against the Mimico Mountaineers. The Northmen travelled to Toronto on Sunday (May 21) to take on the Beaches. After a solid second period that saw the Northmen score five in a row to take a 7-3 lead, things fell apart when Toronto scored four second period goals then go ahead on the lead with three third period goals. Late in the game, Orangeville’s Matt Vangalan scored to bring the Northmen back within a goal but they couldn’t follow up with a tie goal and had to settle for a 10-9 loss to the Beaches. After the weekend the Northmen have a split 2-2 record for the season so far. The Six Nations Arrows have moved into first place in the League standings going undefeated after three games.